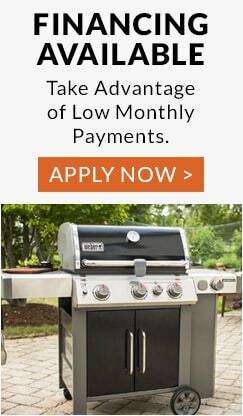 Weber Genesis Gas Grills are known for quality, longevity, performance, innovation, and affordability. Weber Genesis ll gas grills are available in 3 and 4 burner configurations, and some of the models are offered in an array of colors. We offer standard Genesis ll models and Genesis II LX models. As a Weber Alliance Dealer, we also offer the very popular Weber Genesis ll Special Edition models. There's so much to love about Weber Genesis ll Gas grills. With our large selection and so many options to choose from, we're sure we have the perfect grill for you. GS4 High Performance Grilling System- All Genesis ll grills feature the GS4 grilling system which includes an infinity ignition, high performance burners, stainless steel flavorizer bars, and a grease management system. iGrill Compatible- Weber's innovative iGrill 3 system monitors the internal temperature of your meat via the integrated meat probes and wirelessly transmits the temperature to your smartphone, eliminating the need to constantly check your food while it cooks. Outstanding Customer Service- Weber is known for their outstanding customer service. The dedicated Weber customer service team shows up early and stays late, working diligently to ensure that every customer who calls finds a satisfying solution to their problem. A Solid Warranty- Weber believes in the quality and craftsmanship of their grills, and they have updated their warranties to make them better than ever. Weber Genesis ll The Genesis II base model grills come with porcelain enameled cooking grates and are available in 3 or 4 burner configurations. These grills come with a closed or open cart design and are available in stainless steel or various colored porcelain coated steel finishes. Weber Genesis II LX The Genesis II LX models are available in 2, 4, or 6 burner configurations and come in black or stainless steel. They have an enclosed cart design and include cart mounted side burners, lighted control knobs, and motion activated handle lights. Weber Genesis ll Special Edition Genesis II Special Edition models are only available for purchase through authorized Weber alliance dealers like BBQGuys. They are available in 3 or 4 burner configurations, come with 9mm thick stainless steel cooking grates, and include a motion activated handle light. The ever popular SE-330 models are available in 4 beautiful colors. Weber Genesis II Special Edition models all come with a side burner and sear station, and are available in an open or closed cart design. 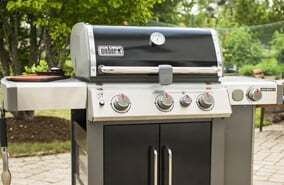 Weber Genesis II Gas Grills are available in either natural gas or propane gas fuel types, but cannot be converted from one fuel type to the other after being purchased. Weber does not make gas fuel type conversion kits, and using one will void the manufacturer's warranty on your Weber grill. To learn more about the differences between the different Weber Genesis ll gas grills check out the Weber Genesis ll Collection Comparison Chart to find the Weber that's right for you.